Second-hand books to support first-rate students! The 2018 edition raised a record $31,831 for Concordia students scholarships. 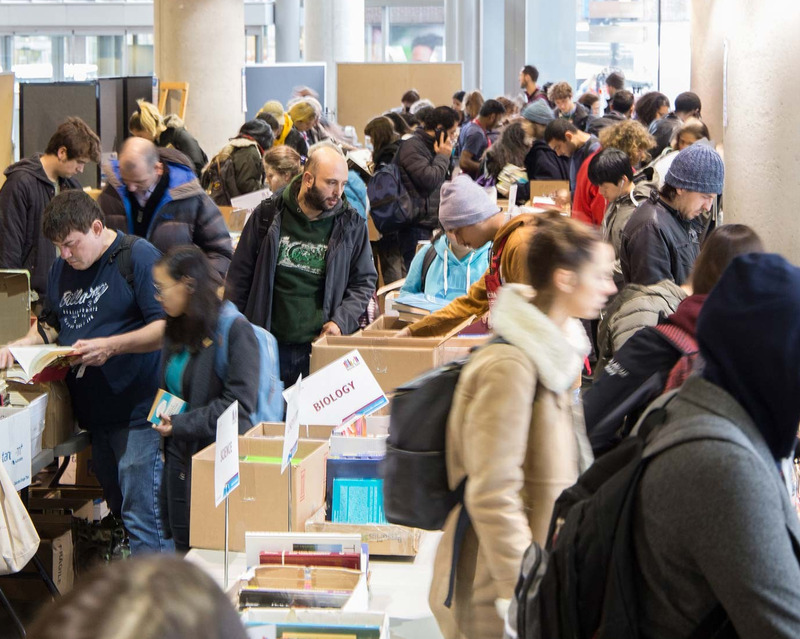 In its 21 years, the Concordia Used Book Fair has raised more than $200,000 for students, while providing a new life for countless books. The book fair engages teams from across Concordia, including Distribution and Transportation Services, Hospitality Concordia and Security. About 75 additional people volunteer, many of them students, including members of the Concordia Stingers men’s rugby team. During the year, volunteers stay busy sorting the many donations we get into categories for sale. Take home a book at the end of your shift as our thanks. Drop off your donation at one of these three locations. Your books should be boxed and labelled: Concordia Used Book Fair – Hall Building Loading Dock. Z Annex, 2090 Mackay St.
For small donations of one or two bags only; all boxes should be delivered to the Hall Building loading dock. Entrance on West Broadway north of Sherbrooke. Take laneway on the right just before the church, drive in, loading dock is on your right.